I had the sudden realization that December is tomorrow and I have a whole slew of project that I want to accomplish before Christmas! So what is up next on my plate? Commissioned projects: I have two projects that I’ve picked up this week. A set of 4 memory pillows and a pair of curtains. I know, not the most exciting of sewing. Socks! Last year (oddly enough about the same time last year), I made a pair of socks. While they are fun, they aren’t truly comfortable but I loved the idea of using some of my fun fabrics to make my own. Peek-a-boo patterns have come out with their own pattern called Cozy Toes and I decided to give this a whirl. I think the fit looks better because of the shaping so I’m hoping for a better fit. Underwear. When I made my latest Spoonflower purchase I picked up a few fun knits to make a pair of cute undies. When the package arrived, Easton saw the prints and claimed them for his own…. oddly enough he asked for underwear too (they must scream underwear prints). It’s been ages since I’ve made underwear for him so I’m going back to the drawing board on sizing for Jalie 3242 and seeing what feels comfortable to him. Tea Towels. Speaking of Spoonflower, all my 2017 calendars have arrived and are awaiting to transformed into this year’s tea towel gifts. I may have gone a bit overboard in ordering though as I have quite a few to make this year. I still have quite a bit of athletic wear fabric left over and intend on making a Penberley Pullover and at least one pair of Jalie leggings to go with it. WHEW! And that’s not counting the new Bag of the Month Club and Seamwork patterns that are released tomorrow! What is on everyone else’s plate this month? This entry was posted in Uncategorized on November 30, 2016 by stacy. These were pretty fun to make, but if I continue on this track, I’m going to need a heat press machine to make it go a lot faster. Also in the works? Family ugly Christmas sweaters! I hope to have these finished by the weekend so we can wear them while we decorate the tree. This entry was posted in Uncategorized on November 29, 2016 by stacy. Apparently, I severely underestimated how long it would take me to finish four of these because I ran to my sewing room right after I put the turkey and put them together. While the hat itself is a piece of cake (although, beware, there was never a seam allowance listed and I think the fit of the hat was too small for Bret’s head), all the stuffing and turning of turkey legs and wings took some time to complete. I also cheated, I hot glued the stuffed bits on! I attempted to attach them by (hand) sewing them in place as directed, but they were pretty floppy (IMHO) after I filled them and hot glue seemed like a reasonable (and faster) option to get them done. The best part? The hot glue held up! None the less, these hats were a hit! They were extremely hot to wear though so they didn’t last longer than 20 minutes before we had to peel them off. I’m very glad to have this behind me, I was getting tired of looking a tan fleece! This entry was posted in Uncategorized on November 28, 2016 by stacy. One of the biggest shopping days of the year starts this week and if you’re looking to fill your cart up with fun sewing books, I have a few new titles for you! Looking to make something special for a little girl in your life? 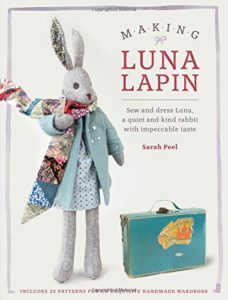 Be sure to check out Making Luna Lapin. 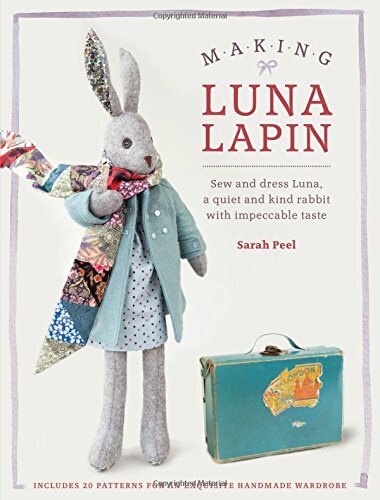 This project book doesn’t just show you how to create a stuffed rabbit, it also has patterns to make an entire wardrobe for her, as well as accessories and even a fabulous comfy chair. Included in the book is also a bit of backstory about Luna and a few of her adventures. It’s a shame there isn’t an illustrated version available so that you could include it along with the rabbit to make an entire gift set. None the less, the end result would make a fabulous gift for anyone! Planning on getting an embroidery machine this Christmas? Own one, but still learning the ropes? Just looking for a few new projects to make in time for the holidays? Then be sure to pick up Modern Machine Embroidery! 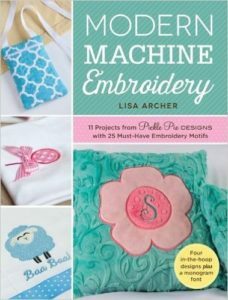 Pickle Pie designs are known for their fun, in the hoop designs and have brought their fabulous embroidery works into a book format. 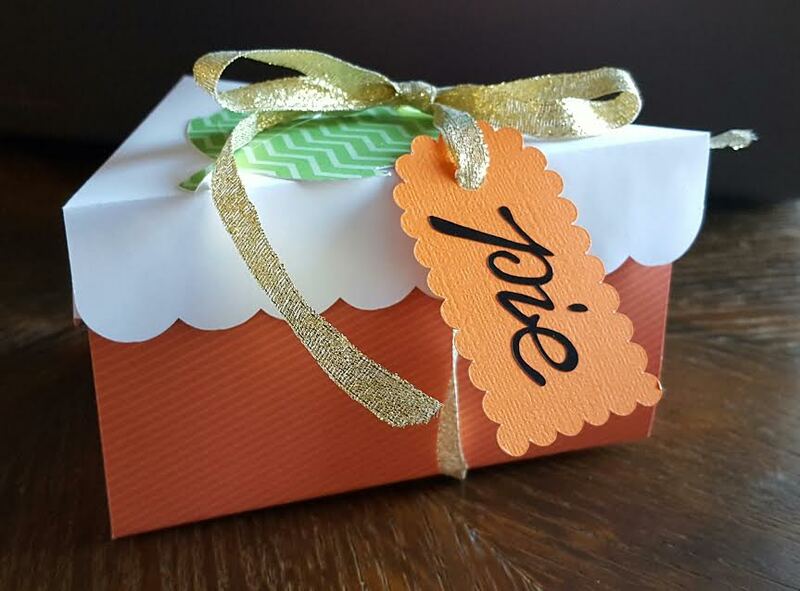 This title has 11 projects and 25 designs to create fun gifts and accessories for yourself. While the instructions are stepped out and photographed in the book itself, the embroidery files are on a handy CD that can be downloaded to your computer and imported in the files that fit your machine’s make. There’s also great sections on how to select stabilizers, threads and understanding machine embroidery designs. You know what’s better than receiving a custom doll? Getting a matching blanket to go along with it! 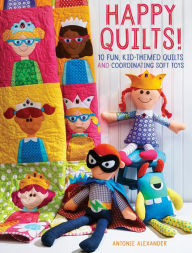 Happy Quilts is a whimsical project book that’s filled 10 projects with kids in mind. Each quilt theme comes with a coordinating soft toy – there’s superheros, princesses, monsters, and more! All the templates and pattern pieces are included in a handy CD in the back of the book, so there’s no tracing or copying involved – you just print what you need. I have to admit, I adore this book and think I may just make myself one…. just because. This entry was posted in Uncategorized on November 23, 2016 by stacy. You may have noticed that there wasn’t a post yesterday. But with a bit of a break, I managed to accomplish a few things (and go to the dentist, too… I’m happy to report, I survived). First off, I have pie boxes! We never manage to make it to dessert after Thanksgiving so I’m sending guests home with their slice in a cute little container. I couldn’t resist trying this project – I did change up the materials some for my own spin, but it was fun and easy to put together. Secondly, and probably most importantly, I cleaned my sewing room. A LOT. You can see the floor and table space. I still need a better system for my PDF patterns, but otherwise, it looks awesome in there. Want to take any bets on how long it will take me to trash it again? I got fabric (in the mail). There’s no exclamation point after that sentence because I’m not overly thrilled with what I got. 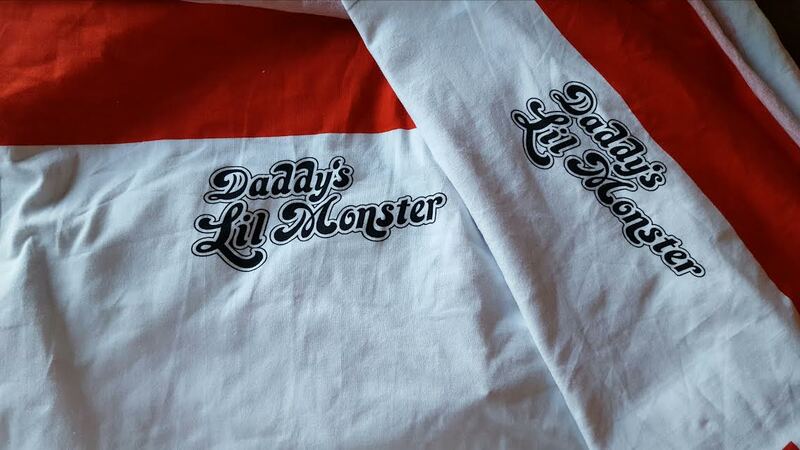 I had made an order through a custom group and ordered a Harley Quinn panel and understood that it would be 36 x 18 – plenty enough to make a tee, right? Well, it arrived in that size, but there’s 3 panels printed on the length – which is way too tiny to fit an adult. I also got an adult size Arkham panel and think that the larger size looks blurry (like the image was blown up and was really meant to be smaller to look clear). So, I’m contemplating making them all into underwear, unless I get a more original idea that strikes me before I cut into it all. 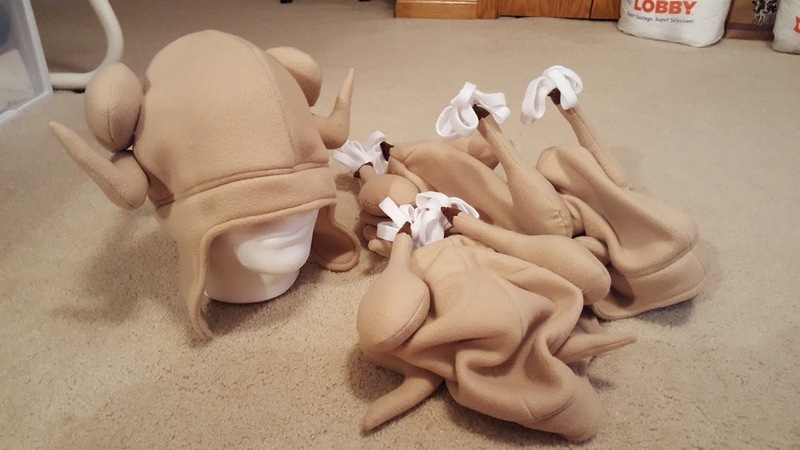 I started the Turkey Hats. I’m hoping to finish these today – or at least get to stuffing the legs and wings. I can’t wait to wear it! This entry was posted in Uncategorized on November 22, 2016 by stacy. Shake the product well before using and make sure you clean your glass surface with rubbing alcohol to remove fingerprints so that it adheres better to the glass. I used ‘regular’ vinyl without any problems. 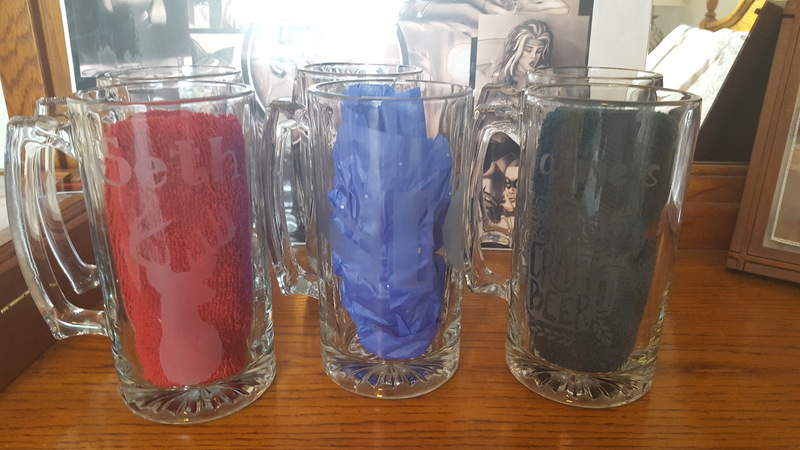 Be sure that you burnish it onto the glass well to prevent any gaps so that the etching cream won’t leak through. I also added a layer of painter’s tape around the image so that when I applied the cream it didn’t accidentally drip or smear on areas outside the vinyl. By the way, lots of people discourage you from using a rounded surface, but I never experienced any problems. Just be sure to apply your vinyl slowly to prevent air bubbles. Apparently, the manufacturer recommends removing the cream after 1 minute – which everyone has agreed is not long enough. I found 6-7 minutes worked great. Most people reported splotches in their final product when they “left the cream alone”. Moving the cream around in different directions (up, sideways, diagonal, etc.) during that 6-7 minutes of etching time gave consistent results. I still found a bit of unevenness, but it is very difficult to see. Most importantly, wear gloves (and eye protection)! The etching cream is an acid so it can give you pretty nasty chemical burns if it comes into contact with your skin. This entry was posted in Uncategorized on November 18, 2016 by stacy. Always wanted to try Hot Patterns (or just a fan)? Download the Joyful Blouse pattern for free! Playing on staying in over the holiday weekend next week? Whip up a new pair of lounge pants to celebrate. Still searching for gifts to stitch? This laminated toiletries bag is perfect for an make-up enthusiast. Planning on making PJs for the older kids? This free pattern goes from size 9 up to 12. Fitted pajamas not your thing? These elastic waist bottoms are a great alternative. It’s boot season, learn how to make boot socks – the easy way! (Note the tutorial is for children, but would easily work for adults too). Add a bit of whimsy to your holiday decorating with this fun tree design. Keep the cold outside where it belongs with an easy to sew draft dodger. Looking for one that has a bit of piping too? 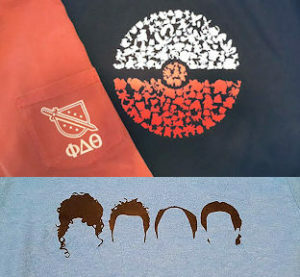 Be sure to check out my (shameless plug) version at WeAllSew. Needing to decorate for Thanksgiving, but don’t have a lot of time? This fringed table runner can be put together in about an hour! Stay warm and look good doing it with one of these fleece and flannel scarves. Did you take advantage of Spoonflower’s fat quarter sale and stock up on calendars (I know I did)? Instead of transforming them into tea towels, whip up a few of these placemats. These kid’s wallets would make perfect stocking stuffers. This entry was posted in Uncategorized on November 17, 2016 by stacy. Normally, I would be showing off the progress of my latest sewing project. However, yesterday, instead of sewing, I spent time with my new Cricut machine and designed a shirt for a friend. Normally, I would show you said shirt, but it’s political and I don’t want to start any discussions….. just know that she voted one way, her mom, the other and she plans on wearing this tee on Thanksgiving because she already knows they’ll be some political talk at the table so why not just throw this out there? We had talked about even making her mom a (different) shirt to wear, but she didn’t think that her mom would wear it anyway so we scrapped it. I’m not going to lie, I love this machine. It does amazing stuff. Today I am going to try my hand at glass etching using the Cricut as a stencil for the glass. I am pretty confident that I may have bitten off more than I can chew with this project, but I had an idea in my head yesterday and I really want to give it a whirl. Cross your fingers it works out the way I envision it! This entry was posted in Uncategorized on November 16, 2016 by stacy. 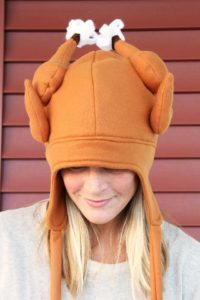 For AGES I have wanted a crazy turkey hat to wear on Thanksgiving. So much so that a few years ago, my brother-in-law’s girlfriend figured out how to crochet one for me to wear. Now, I get to sew one (or 4) up for myself. Remember that pattern I pointed out in last week’s Linky Thursday? That is my next project! I headed to the fabric store (btw, tan fleece is hard to find, so I had to settle for brown…. our turkeys will look a little “undercooked” in comparison to the inspiration photo). I wound up picking up 2 yards (The pattern calls for 3/4 yard per hat, but I figured 2 would be plenty for multiples) – which was plenty enough material to make 4 hats. The best part? Because I have fiberfill on hand, the total price for this project came to $7.48! What a total bargain for a day of interesting photo opportunities. This entry was posted in Uncategorized on November 15, 2016 by stacy. Last week I mentioned that my next project would be the Cora Tights. I’m happy to report that they are finished! While the pattern looks daunting, overall it was pretty easy to put together – definitely more time consuming than a ‘regular’ pair of leggings, but I was still able to have these completely finished in a day. The fit is definitely more snug (which I know is necessary when you are running), however some of that could be due to my fabric choices which may have had a bit less stretch that others I have used. 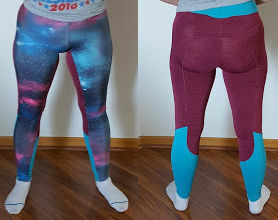 What I like most about these is that they are striking (the teal works better than what I anticipated, but I still wish I could have found more of a ‘space blue’) and can rival any workout pants from lululemon or Victoria Secret…. did I mention they have a cool pocket in the back, too? You’ll definitely be seeing more of these in the future from me. Now that the weather is turning colder, I have a feeling that comfy pants will soon become a wardrobe staple! This entry was posted in Uncategorized on November 14, 2016 by stacy.